These Antique Green Jumbo Hydrangeas are a massive 6-12 inches across! Length, including bloom, is 18-20 inches, with 2-4 leaves. Antique Hydrangea flowers have one stem per bloom and are available year round from our partner farms in Colombia and Ecuador. Free Shipping! These Antique Green Jumbo Hydrangeas are a massive 6-12 inches across! Length, including bloom, is 18-20 inches, with 2-4 leaves. Antique Hydrangea flowers have one stem per bloom and are available year round from our partner farms in Colombia and Ecuador. 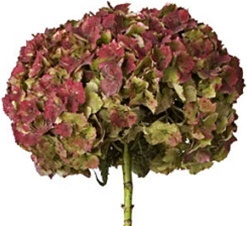 The hydrangea becomes "antiqued" when it is mature, at the end of the growing season. It loses her blues and turns to shades of green with maroon or red highlights on the tips. The actual colors will vary with the growing region, variety, time of the year, etc. Antiquing is not what you'd call an "exact" science. Mother Nature often surprises us! Due to computer monitor variations, they may differ somewhat to the colors featured here.